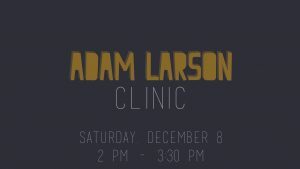 Adam Larson’s in St. Louis! He’s offering an intimate clinic on improvisation and introducing his new book, Leaps and Sounds. Adam Larson, who holds BM and MM degrees in Jazz Performance from The Manhattan school, has been described by Nate Chinen of the New York Times as “the sort of jazz musician who gets flagged early on as a promising talent and then hustles to meet every requirement for success.” Larson has released four albums, and his most recent recording “Second City” received a four-star rating from DownBeat Magazine and was listed as one of the best releases of 2017 by Downbeat and Jazziz Magazine The artist keeps an active schedule, having performed at many prominent venues across the U.S. including The Blue Note, The Village Vanguard, The Jazz Standard, The 55 Bar, Jazz at the Bistro, The Jazz Showcase, and many others.